A historical novel perfect for readers of THE PARIS WIFE, THE BLUE PERIOD follows the tragic love triangle between Pablo Picasso, his best friend, and a model, which inspired what is arguably one of the most artistic moments in human history. 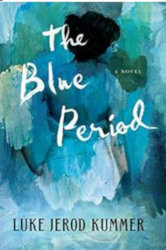 THE BLUE PERIOD will be released by Little A on July 1, 2019. At the dawn of the 20th century—before Paris became a hotbed of artistic expression, and long before Pablo Picasso’s groundbreaking work in cubism began—the young artist, barely an adult, came to Paris from Barcelona and began painting models, and interacting with them. He and another painter shared an apartment and studio, and quickly became involved with a young woman they’d both painted. The love triangle that evolved eventually led to the suicide of Picasso’s friend, a death that plunged the 19-year-old Picasso into a deep depression. From that emerged what art historians now call “The Blue Period,” thought by many to be a reference to his palette, but in fact encompassing the early, dark mood that beset Picasso—until true love saved him at last, and led to the Rose Period that first brought him fame. THE BLUE PERIOD will explore a crucial turning point in art history through a portrait of the great artist as a very young man. Luke Jerod Kummer has written for The New York Times, The Washington Post, New York Magazine, The New Republic, Bloomberg, The Village Voice, The Washingtonian and Kindle Singles. This is his first novel.